I want to ask all the people who speak or understand Māori to change the preferred language on their devices to Te Reo Māori at least for one day during Māori Language Week July 4 – 10, 2016. I emigrated to New Zealand in 2005 and I have loved this country ever since. My close friends know that I get emotional when I speak about the incredible difference living here has made to myself and my family. I’ve tried to give something back whenever I could, which brings me to this blog post. With your help, I want to prove that there is a large enough group of people in New Zealand that would like to see support for Te Reo Māori in our software. Right now we are dealing with a vicious circle: businesses don’t see enough Māori users in their analytics therefore it’s difficult to prioritise implementing support for this localisation over other initiatives. I believe that we can help break this cycle by setting on our devices the default (preferred) locale to be Te Reo Māori. Regardless if you’re a technical person or not, there are two things you can do to help: set Te Reo Māori as the preferred language on your device (even just for one day!) and then spread the word. apps and websites will fall back to English when Te Reo Māori is not supported. this change will not update the language used by the operating system. It will however let apps present content in Te Reo Māori whenever they can. See the Google search screenshots below. Do this from Settings > General > Language & Region > Other Languages (or Add Language if you already have more than one). Look up Māori and then select “Prefer Māori”. Running a Google search for “Te Papa” will then produce the same results, but the word “Images” has been replaced by “Atahanga”. You may think it’s a worthless change. That would be true if nobody else makes the language change I’m encouraging you to make. The more of us do it, the more we move the statistic needle. Android support is patchy. Unfortunately support for Te Reo Māori does not come out of the box for the official Android releases. 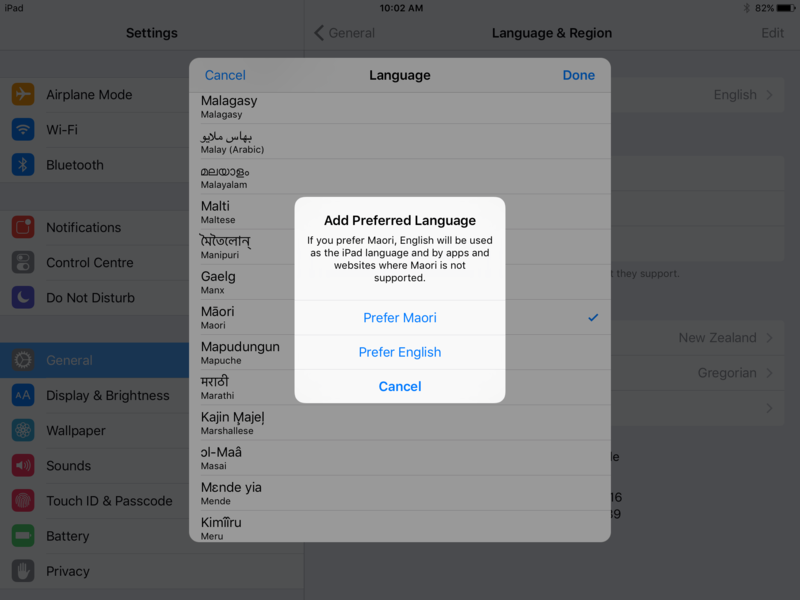 If you’re lucky, your particular device may have Māori or Te Reo as an entry in Settings under Languages. The good news is that Google Developer Group Wellington (which I founded a couple of years ago) has support from Google to put together an official Pull Request to Android that will introduce support for Te Reo Māori. Get in touch if you wish to help. I need to disclose that I am not an active Windows user so the information below may be out of date. I do believe that Māori has been an option since Windows 8, though. Below you can see a couple of screenshots of what you need to do to express your preference. 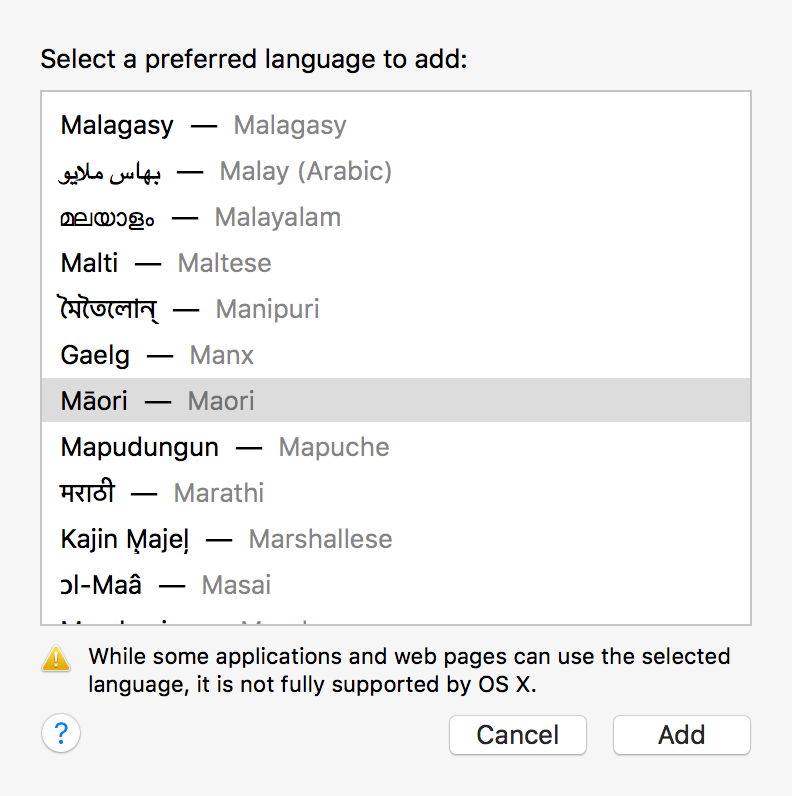 Setting the preferred language on the Mac is also quite straight forward. Navigate to Settings and search for Language & Region. Check here that you have successfully updated your language settings. From this point onwards every time you use an app or website you will be counted. Ka pai! I believe the best thing you can do next is to just speak to people about this topic. It really helps with awareness and it’s more personal. An easier option would be to send your friends a link to this article or to any of the resources on the internet that discuss this topic. If you want to be succinct you may consider asking your audience: “Set your device’s language to Māori during Māori Language Week July 4 – 10. Help make Te Reo an option in the apps you love. #TeReoBeCounted”. You can click here if you want to tweet this message. A number of organisations have accepted to help this initiative in one way or another. There will be a follow-up post after this week is over to report on what we have collectively learned. Thank you Trade Me, Xero, Powershop, Radio New Zealand, KiwiBank, and Te Papa. If you engage with their apps and websites, and you have set Te Reo Māori as your preferred language, your voice will be heard. If you build apps / websites targeted at New Zealanders, you can help, too. What you need to do is to share with me the number of users or sessions that you see for the mi_NZ locale, before and after Māori Language Week. Preferred: raw numbers. For example you could tell me Unique users on the 4th of July and on the 11th of July. You can check these numbers with most analytics tools anytime after the 11th of July. Great: growth numbers. 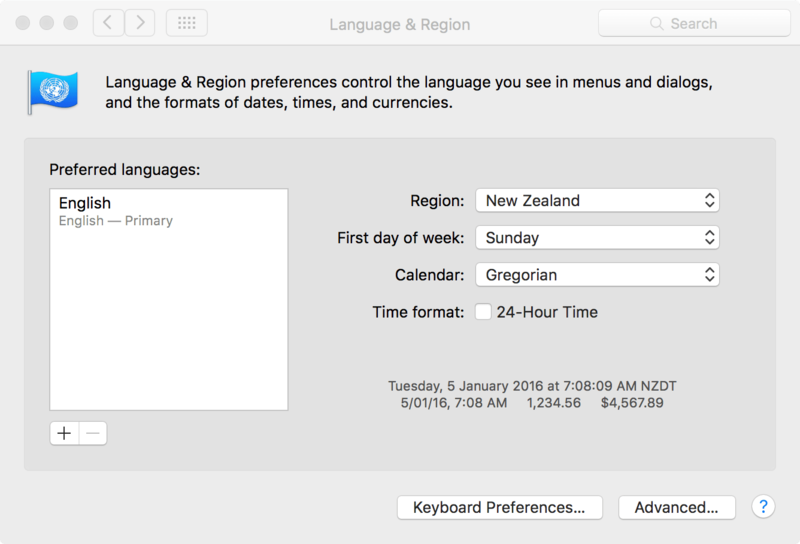 If you are comfortable with this option instead, then please share just how many of your users preferred Te Reo Māori on the 11th of July, versus the 4th of July. Good: percentage change. If you’d rather not disclose the number of users who chose to start using Te Reo Māori, then maybe you can share with me what the % change was (positive or negative). Feel free to use (without the need for attribution) the instructions above to tell your users how they can go about setting Te Reo Māori as their preferred language. Get in touch with me if you want to continue the conversation. Twitter. “Set your device’s language to Māori during Māori Language Week July 4 – 10. Help make Te Reo an option in the apps you love. #TeReoBeCounted”. Click here to do it right now! Facebook. Use whatever language you are comfortable with. Feel free to use the instructions above on how to change the language settings. Make it clear if your app/site supports or doesn’t support Te Reo Māori at the time of the post. Link to my blog post if it helps. update your showroom/store. Prepare and clearly label devices that already run Te Reo Māori. Train your sales staff and ask them to spread the word to your customers. Now that you’ve spread the word, these users can be counted in the participating apps and sites. It would be a nice gesture to mention (wherever appropriate or by linking to this page) who else is participating in this campaign. After the campaign is over, I will aggregate the results and I will communicate to the participants what we have collectively learned. I will then follow up with another blog post for the benefit of the community. Aotearoa is my home. There are many other people, much more informed than me, who can probably tell you why doing this is a good (or not so good) idea. What follows is my personal view. Kiwis are amazing. I love Wellington. Even the laws are pretty great when comparing with the rest of the world. All these things play a an important part in how I feel about this place. However I feel that the language does not contribute at its full potential to this sense of belonging. What does a best case scenario look like? Get localisation support added to the roadmap of as many apps and services as possible. In reality, we may never be able to know how many people prefer Te Reo. All I want is to show that this number is large enough to justify treating it as a priority in our apps. What does “our apps” mean? I am doing this as a community member, not as the Head of Mobile at Trade Me. By “our apps”, I mean the apps and websites of the entities (people or organisations) who participate in this initiative and wish to better understand their audience. We’ve promoted this. Now what? If you build apps or websites please start tracking the number of users and sessions that use mi_NZ (Māori, New Zealand) as their preferred language. If the number of users and sessions goes over the critical threshold for your organisation, then it’s time to update your definition of “done” and include localisation to the new features and apps that you build from here onwards. Don’t forget to update your testing strategy to cover text input in Te Reo Māori. On iOS, you can go back to the same settings screen and tap the Edit button on the top right. Then you will be able to remove the newly added language. Clarified that when there is only one iOS language, the option reads “Other languages” rather than “Add Language…”. This entry was posted in Social and tagged About Me, Maori, New Zealand on July 4, 2016 by Nick.